Please visit our program pages for upcoming events. The Foundation is happy to announce availability of its Streaming Website. You can access the site by clicking here. This website sells the full library of Dr. Kenneth Wapnick's teachings on A Course in Miracles in audio and video streaming format. The website also carries Staff Taught Classes as video streaming products, and Podcasts of weekly classes as free audio streaming products. Stream your products on a desktop computer, a laptop, a tablet, or a phone. All you need is an internet browser and an internet connection to access your purchases at any time and at any location. If you are interested in receiving monthly emails with news about the Streaming site, sign up here. Visit our Monthly Specials page for discounts on teaching materials by Dr. Kenneth Wapnick. Amazon Smile is a simple and automatic way for you to support the Foundation every time you shop, at no cost to you. 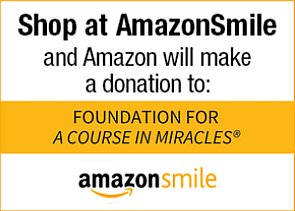 When you shop at smile.amazon.com, you'll find the exact same low prices, vast selection and convenient shopping experience as Amazon.com, with the added bonus that Amazon will donate a portion of the purchase price to the Foundation for A Course in Miracles. Use social media to keep in touch with the latest news and information from the Foundation. Visit each site below and subscribe. "Along with the publication of the Course in English, the Foundation for Inner Peace established a translation program in 1982 under the joint direction of Dr. Kenneth Wapnick of the Foundation for A Course in Miracles (FACIM) and Dr. William Whitson of the Foundation for Inner Peace. This collaboration continued until Dr. Kenneth Wapnick passed away in December 2013. The Translation Program continued under the direction of Dr. Whitson until his death in February 2018. FIP continues to manage a comprehensive translation program. FIP has shepherded the translation and publication of the Course into over two-dozen languages. This includes translations published in Afrikaans, Bulgarian, Chinese (both Simplified and Traditional), Croatian, Czech, Danish, Dutch, Finnish, French, German, Greek, Hebrew, Hungarian, Italian, Japanese, Korean, Norwegian, Polish, Portuguese, Romanian, Russian, Slovene, Spanish, and Swedish, with more to come. The popular website of the Foundation for Inner Peace contains basic information about what A Course in Miracles is, how it came into being, and what it says. It provides a firsthand, authentic account of what the Course is and the extraordinary story behind it, including its scribes, its purpose, what it offers, and the activities which have evolved and are evolving around it. Interactive "Online Lessons" are available in English as well as Dutch, French, German, Italian, Portuguese and Spanish. In addition, in partnership with the Foundation for A Course in Miracles, an archival site for the Course has been created. ACIM-Archives offers you original and authentic material from the Foundations' historical collection, most of which has never before been released." The following Foundation books have been translated into German: The Most Commonly Asked Questions About A Course in Miracles, A Talk Given on A Course in Miracles, Glossary-Index for A Course in Miracles, The Fifty Miracle Principles of A Course in Miracles, Forgiveness and Jesus, Awaken from the Dream, Absence from Felicity, A Course in Miracles and Christianity: A Dialogue, The Message of A Course in Miracles, and A Vast Illusion. Several audiotapes have also been translated into German. If you are interested in ordering, please contact: Greuthof Verlag und Vertrieb GmbH, Kybfelsenstraße 41, D-79100 Freiburg., Germany, Tel. 49-761-388 45 996, FAX 49-761-388 45 997. Foundation books translated into French include the following: A Talk Given on A Course in Miracles, The Most Commonly Asked Questions about A Course in Miracles, Ending Our Resistance to Love, The Fifty Miracle Principles, Awaken from the Dream, and The Healing Power of Kindness-Volume1: Releasing Judgment. For ordering information, please contact Les Éditions Octave Inc. In addition, The Arch of Forgiveness has recently been translated into French and is available only through Amazon, including Amazon France, Amazon Canada, Amazon Germany, Amazon UK, and Amazon US. The Foundation's distributor of books, CDs and DVDs in the UK is Miracle Network, 12A Barness Court, 6/8 Westbourne Terrace, London W2 3UW. They may be contacted by phone at (020) 72762 0209 or E-mail: [email protected]. Their website address is www.miracles.org.uk. We are very pleased to announce the newly created jacim.com website, where many of the Foundation's articles and teaching materials will be available for Japanese students of A Course in Miracles. The development of the site was undertaken by our Japanese translators Miyoko Kato and Yoshiko Sawai, whose excellent work we have supervised for many years. We are very pleased to inform you of an Italian website—www.ucim.it —where many of the Foundation's articles and teaching materials are available for Italian speaking students of A Course in Miracles. The website is a collaborative venture undertaken by our Italian translators Isabella Popani and Fulvio Merlino, together with Patrizia Terreno, whose excellent work we have supervised for many years. Through this website you can order the Italian version of our book The Most Commonly Asked Questions about A Course in Miracles.